DESCRIPTION: The M-17 started as a vision of a polymer constructed marker with a set of very unique features. Since it first saw the light of day; the M-17 has undergone so many complete overhauls that it is nearly undistinguishable from what it once was. The M-17 now lives in three different platforms to offer players a marker tailored for their role on the field. The heart of the M-17 runs on a fully mechanical and internally regulated blow forward system called the Heat Core. The Heat Core has made its name in its extreme ease of maintenance; reliability and unmatched consistency. Perhaps best known for its consistency; the Heat Core is often seen to have as little as a +/- 2fps swing on the chronograph. When accuracy is heavily determined by consistency a marksmans top choice is the marker with the least deviation. To add to this functionality the M-17 includes a revolutionary new mechanical full-auto firing system. The latest generation of heat core includes many new improvements to make it easier and faster to maintain than its predecessors. Controlled by the select fire switch on the markers grip; you can switch from semi automatic to fully automatic without the need for batteries or any other electronics. All M-17 models now also include an AR-15 style cocking handle to act as an anti jam in the case where a ball or First Strike round manages to jam in the marker. The M-17 also includes a new grip design that allows for simple attachment of any standard AR-15 grips made by many popular manufacturers to suit your ergonomic needs. The Heat Core is easily removed with its renowned 2 pin takedown that removes the markers entire internal gas system out the back of the marker. The grip also includes a new fire selector switch allowing a simple transition from safe to semi to full auto. This selector switch can be reversed in its housing for left handed use or replaced with an optional ambidextrous fire select switch. Continuing from the M-Series Paradigm Pro and M-Series Elite models; the M-17 is ready to fire First Strike rounds out of the box and includes one of our new 18 round continuous feed First Strike magazines. The M-17 accepts all current Square Head magazines from MILSIG. Any existing users of round collar magazines can upgrade their existing magazines to a squarehead quickly and at a minimal cost. CQC- CLOSE QUARTER COMBAT This is our most compact M17 model. Replacing the CQB PRO; this little marker packs punch! Beginning with a steel plate encased Polymer body; we added a new Polymer Magazine Well with an ambidextrous paddle Magazine Release. We then added a two-piece Polymer Integrated Rail system. We finished it off with a short smoothbore Bull Barrel for that signature SMG look. Economical without compromise; this amazing MagFed marker does everything you want at an amazing price. This is the marker you asked us to build; and we delivered. 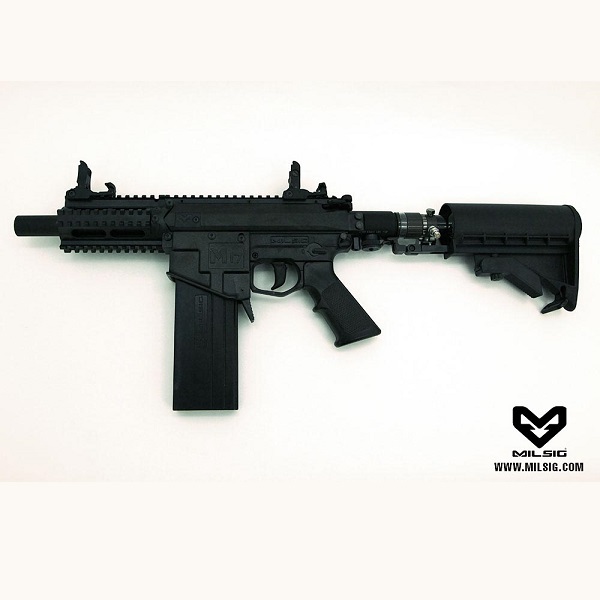 This gun accepts Tippmann A5 threaded barrels.